This article is from the book Hindu Gods and Goddesses. Who has Modaka in hand! Lord Ganesha is the elephant-headed God. He is worshipped first. His Names are repeated first before any auspicious work is begun, before beginning any kind of worship. He is the Lord of power and wisdom. He is the eldest son of Lord Siva, and the elder brother of Skanda or Kartikeya. He is the energy of Lord Siva, and so He is called the son of Sankara and Uma. By worshipping Lord Ganesha, mothers hope to earn for their sons the sterling virtues of Ganesha. The following story is narrated about Lord Ganesha’s birth and His having the head of an elephant. Once upon a time, at bathing time, the Goddess Gauri, the spouse of Rudra, created Ganapati as a Suddha, or pure white being, out of the mud of Her body, and placed Him at the entrance of the house. She told Him not to allow anybody inside and went for a bath. Lord Siva Himself returned home quite thirsty and was stopped by Ganesha at the gate. Siva got angry and cut off Ganesha’s head, taking Him for an outsider. Gauri came to know of this and grieved much. Siva ordered His servants to bring the head of any creature that might be sleeping with its head northwards. The servants made a thorough search end found only an elephant in that position. The head of the elephant was cut off and brought before the Lord. Siva joined the head of the elephant to the body of Ganapati. Lord Siva made Ganapati worthy of worship by men at the beginning of all their undertakings—marriages, journey, expedition, study, etc. He ordained that the annual worship of Ganesha, should take place on the fourth day of the bright half of Bhadrapada (August-September). Lord Ganesha is an embodiment of wisdom and bliss. He is the Lord of Brahmacharins. He is the foremost among Brahmacharins or celibates. He rides on the Vahana, the small mouse. He is the Presiding Deity of the Muladhara Chakra. He is the Lord who removes all obstacles in the spiritual path and brings worldly success. So He is called Vighna Vinayaka. His Bijakshara is Gang. He is the Lord of harmony and peace. Lord Ganesha represents OM or the Pranava. Pranava is the chief Mantra of the Hindus. Nothing can be done without uttering it. Hence the practice of invoking Lord Ganesha before beginning any rite or work. The two feet are His Jnana Sakti and Kriya Sakti. Lord Ganesha has the elephant-head as that is the one figure in nature which is of the form of Pranava. Riding on the mouse represents that He has killed egoism. He holds Ankusa. This represents that He is the Ruler of the world. This is the emblem of Divine Royalty. Ganesha is the first God, Adi-Deva. Mouse is a small creature. Elephant is the biggest of all animals. Riding on a mouse and wearing the head of an elephant denote that He is the Creator of all creatures, from the biggest elephant to the smallest mouse. Elephants are very wise. Wearing the head of an elephant indicates that Lord Ganesha is an embodiment of wisdom. It also denotes the process of evolution. The mouse gradually evolves into an elephant and finally becomes a man. That is the reason why Ganesha has a human body, the head of an elephant, and mouse as His vehicle. This is the symbolic philosophy of His form. He is the Lord of Ganas or groups, such as the group of elements, the group of senses, the group of Tattwas. He is the head of the followers of Siva. The Vaishnavas also worship Lord Ganesha. They have given Him the name of Thumbikkai Alwar, i.e., Alwar with the proboscis. Lord Ganesha’s two Saktis are Kundalini Sakti and Vallabha Sakti. Lord Ganesha is very fond of Modaka, sweet balls made of rice. On one Ganesha Puja Day, He was going from house to house, accepting the offerings of Modaka. Having eaten a good number of these offered to Him, He set out moving on a mouse at night. Seeing a snake, the mouse got afraid and stumbled, with the result that Ganapati fell down. The stomach burst open and the Modakas came out, but Ganappati stuffed the Modakas into the stomach, and catching the same snake, tied it round His belly. Seeing all this, the moon in the sky heartily laughed. Ganapati was annoyed at the behaviour of the moon and pulled out one of His tusks and hurled it against the moon and cursed that no one should look at the moon on the Ganesha Puja Day. If anyone looks at the moon, he will earn bad name or censure or ill repute. If anyone happens to see the moon on that day by mistake or by chance, if he repeats or hears the story of Lord Krishna’s clearing His character in respect of the Syamantaka jewel, he will be free from that ill-repute or blame. Lord Ganesha was pleased to ordain thus. Glory to Lord Ganesha! How kind and merciful He is unto His devotees! Ganesha and His brother Lord Subrahmanya or Kartikeya had once a dispute as to who was the elder of the two. The matter was referred to Lord Siva for final decision. Lord Siva decided that whoever would make a tour round the world and come out first to the starting point had the right to be the elder. Lord Subrahmanya flew off at once on His vehicle, the peacock, to make a circuit of the world. But Ganesha went round His parents and asked for the prize of victory. Lord Siva said: "Beloved and wise -Ganesha! You did not go round the world". Ganesha replied: "No, but I went round My parents. My parents represent the manifested world". The dispute was settled in favour of Lord Ganesha. 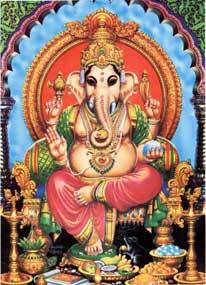 Ganesha was thereafter acknowledged as the elder of the two brothers. Ganesha got a fruit as prize for this from Mother Parvati. In the Ganapati Upanishad, Ganesha is identified with the Supreme Self. The legends that are connected with Lord Ganesha are recorded in the Ganesha Khanda of the Brahma Vaivarta Purana. Without the grace of Sri Ganesha and His help, nothing whatsoever can be achieved. No action can be undertaken without His support, grace or blessing. During Aksharabhyasa (teaching of the alphabets), the child is initiated into His Mantra of Om Sri Ganeshaya Namah in Maharashtra and other places. Then only the alphabet is taught. The following are some of Lord Ganesha’s most common Names: Sumukha, Ekadanta, Kapila, Gajakarnaka, Lambodara, Vighnaraja, Vinayaka, Dhoomraketu, Ganadhyaksha, Balachandra, Gajanana, Vakratunda, Surpakarna, Heramba, Skandapoorvaja, Siddhivinayaka, Vighneshwara. He is also known as Maha Ganapati. His Mantra is Om Gam Ganapataye Namah. Sadhaks who worship Ganesha as their Ishta Deva, repeat this Mantra or Om Sri Ganeshaya Namah. Ekadantaya Vidmahe Vakratundaya Dheemahi Tanno Danti Prachodayat: this is Ganesha Gayatri. The devotees of Lord Ganesha can do Japa of this Mantra also. Ganesha Chaturthi is one of the most popular of Hindu festivals. This is the birthday of Ganesha. It is the day most sacred to Lord Ganesha. It is observed on the fourth day of the bright fortnight of Bhadrapada throughout India. Clay figures of the Deity are made, and after being worshipped for two days, or in some cases ten days, are thrown into water. The yearly Ganesh Chaturthi Puja that is thus observed throughout India is the festival version of the Ganesh Vrata that has become enjoined as a compulsory observance, as a matter of tradition. Apart from this annual Puja, the Ganesh Vrata—also known by the name of Siddhi-Vinayaka Vratam—is done as a special Vrata for the attainment of some particular end in view, usually for clearing oneself of false and unjust accusations and charges, recovering lost objects, regaining lost status, and removal of obstacles in an enterprise. It is to be performed on the fourth day of the dark fortnight. It consists of elaborate worship of Lord Ganesha with Shodashopachara (a 16 step worship) and various offerings, after appropriate Sankalpa (desire). The divine sage Narada prescribed this Vrata to Sri Krishna who wished to wipe off the dishonour of the charge of stealing the Syamantaka Gem. Much later, Krishna instructed Yudhishthira to perform this Vrata at the time of the Mahabharata war. This renowned Vrata was effectively celebrated by the Devas to obtain Ambrosia on the eve of churning the ocean, by Damayanti to find her lost husband, by Lord Rama to get back Sita, by Indra to defeat Vritra Asura, by Bhagiratha to get down the celestial Ganges, by Draupadi and by Samba to get cured of incurable disease. He who performs this Puja with faith, devotion and concentration obtains all that he desires and attains the Highest Abode. May the blessings of Sri Ganesha be upon you all! May He remove all the obstacles that stand in your spiritual path and bestow on you both Bhakti and Mukti!